The Internet Gives You Control | Printer Fun | Break It And Learn! Blinking lights meant my printer needed help from an Epson service technician, my owner’s manual said. Internet to the rescue yet again! You really can find anything on the internet. Reading through forums, these blinking lights are often blinking lights of death which means more trash in the landfill since it’s often cheaper to buy a new printer than to service the printer. Ha. Which is what I did – I bought a new printer, so now I have two. 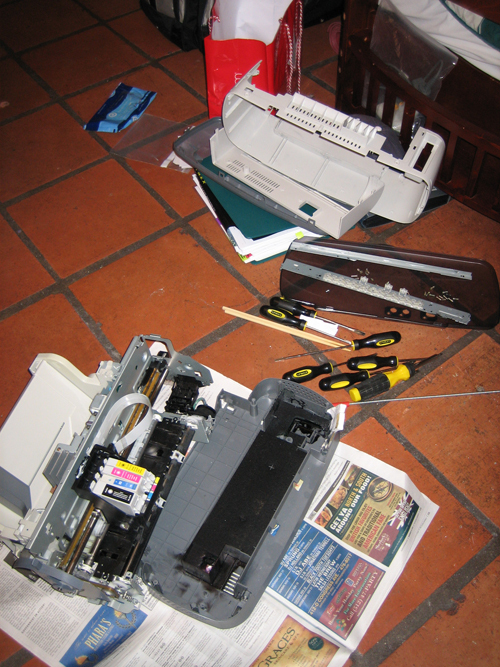 But that was before I had time to take apart my printer.